Acuvue Vita for Astigmatism are monthly, toric silicone-hydrogel contact lenses from Johnson & Johnson for the correction of astigmatism. They are designed for daily wear and have to be replaced after one month. The revolutionary HydraMax™ Technology maximizes and preserves lens hydration and ensures maximum comfort throughout the whole month, even in challenging conditions. The rounded, thin edge provides a smooth fit, eliminates the risk of irritation and increases wearing comfort. 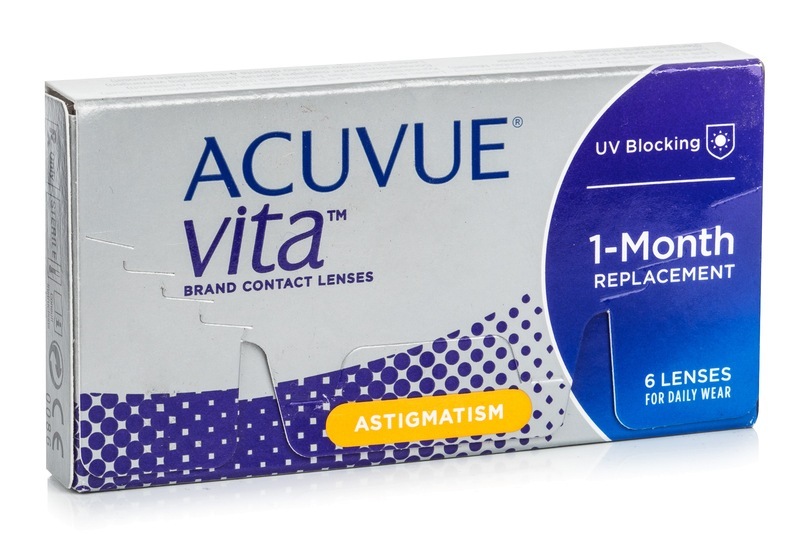 Acuvue Vita for Astigmatism contact lenses come with a UV filter that Blocks 99.8% of UVB and 93.4% of UVA and have a light blue tint for easier manipulation. Thanks to the unique Accelerated Stabilization Design technology, also known as BLINK STABILIZED Design, the lenses remain in place, no matter how abrupt the movements of your head and eyes. This technology uses the natural winking motion of eyelids to keep the lenses in the right position. So the vision stays sharp and stable at all times, regardless of eye movements and head position. The UV filter in contact lenses increases the protection of the cornea from the dangerous ultraviolet radiation. However, lenses do not cover the entire eye and surrounding area, so the combination of contact lenses that have UV filter and sunglasses is the ideal protection against harmful UV rays.